The Hidden Glasgow Forums • View topic - A Real Hidden Glasgow - are there any other time capsules? A Real Hidden Glasgow - are there any other time capsules? A little treat from 1965. The Renfield Street Church was demolished and uncovered a time capsule buried when the church was built and uncovered a look at life in 1848. This is a real Hidden Glasgow Story. Do you know of any other time capsules buried somewhere? was one not opened a few months back at the City Chambers? Jim would be able to fill you in on that. Very intersting Alex - although i'd imagine if that picture was taken today that the HSE would have something to say about the complete lack of Hard Hats/Hi Viz clothing etc etc!! when my uncle was at primary school in early/mid 70's they buried one somere in amongst "Sight henge" the standing stones in sighthill park. Would be interesting to know what happened to the time capsule from Renfield St. afterwards and where it is now. Maybe the contents got dispersed. I'm sure I've seen a time capsule on display at the People's Palace but I think it's of a somewhat later date than this one. I recall being involved in the placing of a time capsule at the beginning of the building of the new Partick South church. Unfortunately I can't remember what went into it, probably some BB badges, a newspaper and various other bits and pieces. Still quite a lot of time capsules getting placed these days in the larger new builds, particularly the City Centre. I must have seen about half a dozen going in the ground over the years. Always seem to go with coins, whisky, newspapers and letters etc. Every building of any consequence in Glasgow in the 18th and 19th, and probably most of the 20th, centuries had a public ceremony to lay the foundation stone. Into these foundation stones was placed what is now known as a "time capsule". So, just about every old building still standing in Glasgow has one of these. None of them are, in themselves, interesting, since we have other copies of the newspapers, examples of the coins, and so on. What is so exciting about "time capsules"? They contain nothing we don't already have, and the ceremony of laying the stone was comprehensively recorded at the time. Ronnie wrote: What is so exciting about "time capsules"? They contain nothing we don't already have, and the ceremony of laying the stone was comprehensively recorded at the time. Good question. Especially as like you say they never seem to contain nothing unique. Isn't the basic problem that instead of being buried and forgotten - so that they are found a few generations down the line, when their contents will be unusual and represent thngs that then belong to a bygone society and culture - they are being actively sought out within living memory by folk interested in getting little more than a headline, and a little publicity? 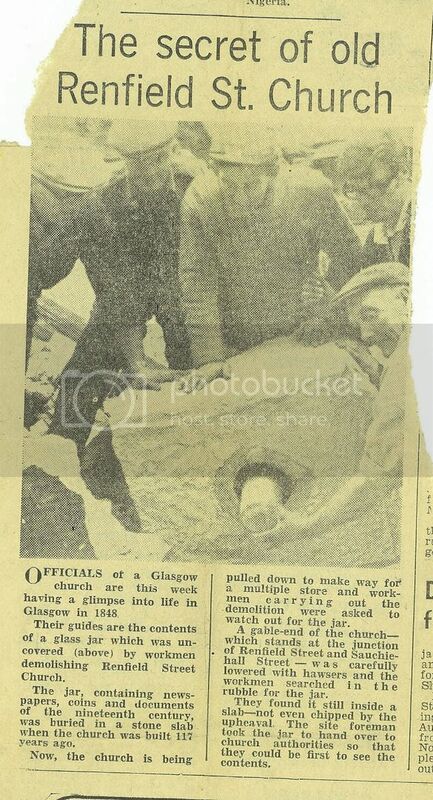 What could be a valuable future resource, as has been demonstrated in the recent 'Glasgow clippings' thread here, is being destroyed by people who have no real interest in history, just their own importance. As Ronnie noted, there's nothing exciting about a 10, 20 or 30 year old capsule being opened, most folk probably have better stuff lying around the family home, but put another 0 on the end, and that's a different story. I blame Blue Peter. As I recall, they were forever burying the things, and digging them upa few years later. Great for kids who probably weren't born first time round, but it's done real damage to a potential resource. The capsule in the clipping had been there for over 100 years. Renfield Street was my family church. The Minister Rev. Leslie Hope christened all my brothers and sisters. It is my understanding that the Elders of the church kept the contents secure and together with some additional items from 1965 the time capsule was placed somewhere in the Renfield St, St Steven's Church located at the other end of Bath Street. Re: A Real Hidden Glasgow - are there any other time capsules? When I was in primary school there was one placed in a space found under the altar in Holy Cross Church in Croy, not exactly Glasgow I know, but its not too far away. There's one buried in Monklands, just off the M8. There's one under the Weaver Buttery development opposite The Buttery on Argyle Street and there are plans for one under the development at Kent Rd/ Brechin St/ Berkeley St.